Join LM Radio for an evening of great musical memories with The LM Legends featuring Bobby Louw, Brian Mulder from Peanut Butter Conspiracy with hit songs Understanding and Amen and Geoff St. John, famous for hits ‘Kiss Me Kiss Your Baby’ and ‘Candy’ and Jody Wayne. It’ll be a great informal vibe with the artists chatting a bit about their careers and performing some of their hit songs. 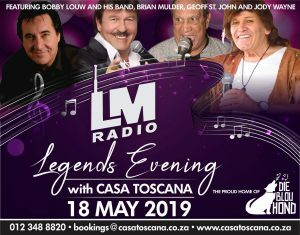 Bobby Louw and his band will play some of your favourite songs from the 60’s, 70’s and 80’s – so put on your dancing shoes and dance the night away. There’ll also be plenty of time for signing autographs and chatting to the artists.